Today I’m going to share best paid and free PHP Fiverr clone scripts. With these PHP clone scripts, you can start your own Fiverr like website in a few clicks. You just have to upload the Fiverr PHP clone script to your hosting directory, install it and you’re done. PHPValley offers a great free Fiverr clone script powered by PHP and MySQL. PHPValley Micro Jobs Script supports Facebook and Twitter login, and has an inbuilt PM system and feedback ratings. PHPValley script lets you choose the price you want the gigs to be sold on your micro jobs site. The admin can also approve and reject jobs posted by the sellers and can approve and reject the delivery by a seller. PHPValley Fiverr script also lets you choose the commission you want to take from the money earned by sellers. The script comes with web based installer, so it can be installed and used even if you don’t have PHP coding skills. Default theme of PHPValley is not something you would call awesome, but it’s okay. The theme has modal login box and registration box. Script has search feature too, so buyers can easily search for gigs and it also has “Buyer Requests” feature. As this is a free script, you would have to give a footer backlink to PHPValley. Fiverr clone script by FiverrScript.com is one of the best Fiverr clone scripts. It is used by many successful Fiverr clone sites. The script comes with many great features; it accepts PayPal and Alertpay/Payza as payment methods, it supports many languages (and you can add your own language to it if it doesn’t support yours). You can also buy “Gig Extras Module” for $50 which would add the Gig Extras feature of Fiverr to your site or “Local Bank Payments Module” for $100 which would let your users transfer money directly to and from their bank accounts. Most features would only works if you pay for their modules and FiverrScript includes a “Powered by FiverrScript.com” in the footer and you must pay $60 to get it removed. So, it’s $99 + $60, i.e, $159. 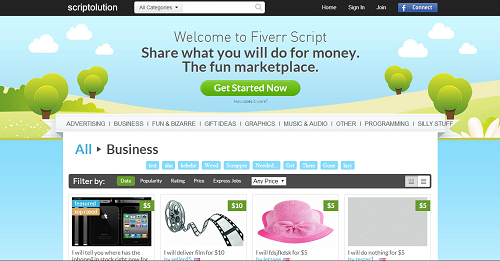 The default FiverrScript theme, inspired by Fiverr V2 (see demo here), looks good. Many micro jobs sites like Fourerr and TenBux are powered by FiverScript. Pricerr Theme is another good Fiverr clone with some unique features developed by SiteMile.com. It supports Bitcoin payments. You can also add a blog with you Fiverr clone site using Pricerr theme. It supports various currencies like US Dollars, Euro, British Pounds, Canadian Dollars, Australian Dollars, Japanese yen etc… Pricerr supports various payment gateways like PayPal, Moneybookers/Skrill and Payza/AlertPay and you can also request them to add any other unsupported payment gateway (you’ll have to pay for it though).Pricerr theme looks very much similar to the Fiverr V2 theme. Some other features of Pricerr WordPress theme are express jobs, instant delivery support, country flags, and user levels. Agriya FPPlatform comes with an awesome default theme. This theme has very less similarities with Fiverr V2 and does not look like a Fiverr ripoff. Agriya Fiverr clone has some good features, but due to its huge price I won’t recommend it to anyone who is planning to start his/her first Fiverr like site. 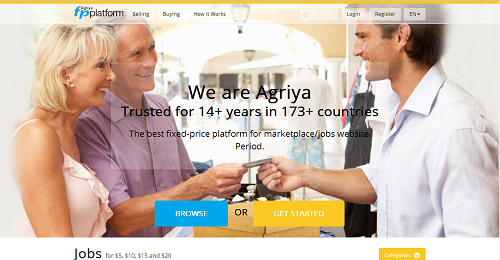 Many established sites like GigBucks use Agriya. Jobfia is not exactly a Fiverr clone but you can still use it to create a Fiverr like site. Jobfia is more like a freelancer script. AlstraSoft script looks exactly similar to the PHPValley Fiverr Clone Script. I don’t think there are much differences between these two. I could only find one Fiverr clone script that is free, if you know more, feel free to use the comment box below. If you are planning to start your own site Like Fiverr, I don’t want to discourage you but it is not that easy as it looks to be. You’d have to work hard to promote your site, make it a trusted and to keep spammers away. Also, you should not used nulled Fiverr clone scripts as most of the nulled scripts are infected with viruses and you’ll be caught once your site get famous (and it’s a bad karma); instead of using nulled Fiverr clone scripts, you should use the free PHPValley script if you actually have no money to buy the paid scripts. Please read this post to know about some established Fiverr Clone Sites. This entry was posted in Reviews and tagged Fiverr by admin. Bookmark the permalink. There are many legit Fiverr alternatives hosted on WordPress with Pricerr theme. So no, that won’t make your website untrustworthy. Don’t use nulled themes. Most of those download would either contain viruses or simply won’t work. BUY the theme or use free alternatives. Does Alexa Rank Matter? Yes And No! Copyright © 2019 WebsiteCouncil . All Rights Reserved.